In this post, I would discuss on how to make the date of the post disappear from the post itself. Example, you would see the date being displayed after the blog post title. Note: This post is not related to removing the date stamp in the url permalink of a blog post. In the past, site owners have to put in custom css in order for the date not to be displayed below the title of the blog post. The option to remove would be using the functions available in the Thesis wordpress theme (version 2.3)….and you can get it done with just a few clicks. To remove the date from being displayed across your blog posts, go to your Dashboard> Thesis> Site Content> Post/Page Output. Click on it to open up the template and go to the “Date” option. Uncheck the column next to “Date”. Close the box and Save the template (the green button). After doing that, you would find the date no longer appears across all your blog post titles. What if you only want to remove the dates on certain templates? archives pages are displayed on searches, categories and archives. A person who performed a search on your site most probably would not click to view articles that are few years old even though the content is supposed to be ‘evergreen’. Take note of 2 boxes located on your right side. Important: Do NOT drag any boxes to the pink box (marked with a red X) as it will permanently delete the function. You would be using the grey box on the right. The post date is located at the Headline then you see Byline and you need to click to expand the Byline. There you would see the “Post Box (Post/Page)- Date” box. 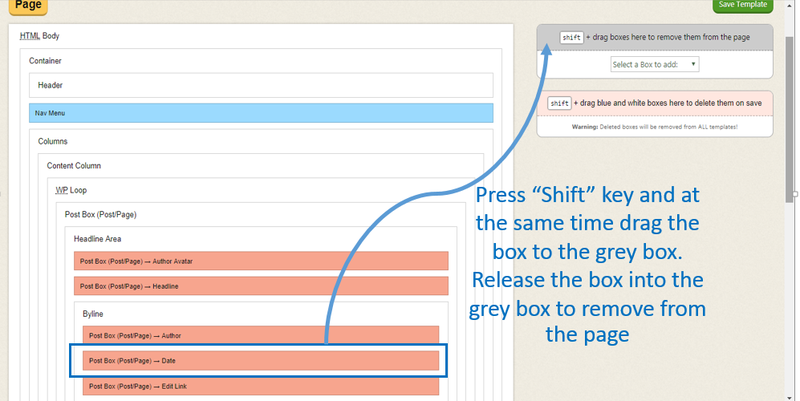 To remove date from being displayed on all your wordpress Pages template, press “Shift” and at the same time click on the box and drag it to the grey box and put inside there. Remember, drag to the GREY box and ‘deposit’ it there. Save the template to reflect the changes and check on your site. Remember, if you are using a caching plugin, the changes may not be displayed immediately. You can try to access your pages via another device like your mobile phone to view the changes. Reminder again: Never ever drag to the pink box because if you do, you would end up permanently remove the date function across all the posts and pages of your site. To proceed to the Archive page, repeat the process by clicking on the “Page” and select “Archives” template. Then locate the date box (at the Headline> Byline). Shift Drag the box to the grey box on your right to remove it from the Archives. If you change your mind and wish to reinstate back the date, no worries. You can find the “Post Box (Post/Page)- Date” located at the grey “Show tray” located beneath the “Post Box (Post/Page)- Content”. Just click on the “Post Box (Post/Page)- Date” and bring the box up. Manually drag the box back to where you wish to have it (back to the byline section after your name). Then save the template and the date would be back on the page. Header image showing up in Facebook shares?